President Akufo-Addo has assured Americans that there is a lot of opportunity for their capital, technology and enterprise in Ghana. He said Africa in general welcome all American companies willing to participate in the exceptional opportunities that exist in the country and on the continent. 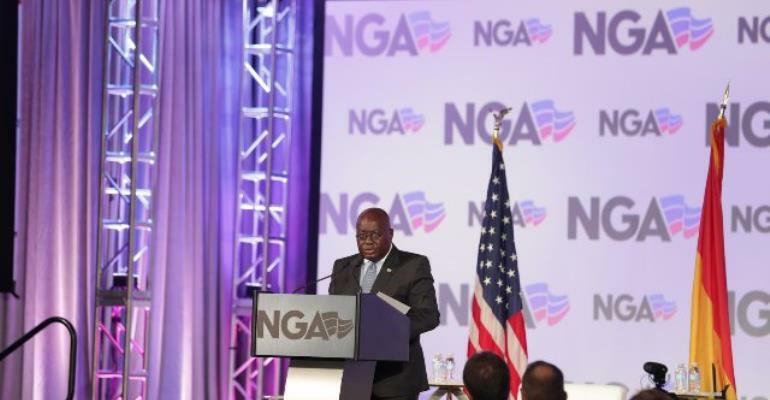 These were the words of the President of the Republic, Nana Addo Dankwa Akufo-Addo, when he delivered the keynote address at the National Governors Association 2018 Winter Meeting, in Washington DC on Sunday. Touching on the country’s oil and gas industry, the President noted that “we are making systematic efforts to develop our new oil and gas industry, into which ExxonMobil has just appeared, signing on January 18, this year, a major offshore oil and gas exploration and production agreement with Ghana. “We stand shoulder to shoulder with the United States in the rejection of terrorism as a legitimate means of resolving political issues. "We appreciate the courageous commitment and the lead role being played in the fight against terrorism by the United States in several parts of the world, including the Sahel region of West Africa,” the President said. He continued, “We stand shoulder to shoulder with the United States in attempting to develop our economies to provide opportunities for its citizens to fulfil their aspirations, especially the youth.